Our Jumbo 9.5' x 12' High Definition Video Movie Screens are perfect for Movie Nights or super-sizing a video or DVD presentation. It's a great way for you to enjoy a "drive-in" style event. These screens are recommended for indoor use only. THE PROJECTORS ARE FOR USED AT NIGHT ONLY. THEY ARE NOT ABLE TO BE USED DURING THE DAYTIME HOURS. WE TYPICALLY PICK UP THE MOVIE SCREEN RENTALS THE NEXT DAY AS YOU AREN'T USING THEM UNTIL 8:30-9PM AND THEREFORE NOT DONE UNTIL AFTER OPERATING HOURS. PLEASE CHECK WITH YOUR DELIVERY SETUP DRIVER ON THE TIME WE WILL PICK THEM UP THE NEXT DAY. The movie screen rentals are perfect for those events that you have a movie night or trivia night - even a gaming night as we can put just about anything on the inflated movie screens to feature your event. 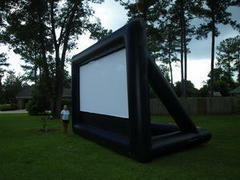 Think about superbowl parties, gaming events, trivia nights and of course the famous movie nights! Keep in mind that we do have a Giant Movie Screen that can be used outdoors just like the movies in the park events you see. Please contact us for any interest.